A postcard featuring Orange Court Apartment Hotel, located at 650 North Orange Avenue in Downtown Orlando, Florida. The hotel was designed in Spanish Revival architectural style by G. Lloyd Preacher (1882-1972) of Atlanta, Georgia, and constructed by G.A. Miller, Inc. (also known as the GA Miller Construction Company) in 1924. The hotel had 275 rooms, a Spanish garden, and a small orange grove. Orange Court was also one of the first hotels in Orlando to have a steam-heated swimming pool. The building was demolished in 1990. Color picture postcard of Orange Court Apartment Hotel, Orlando, Florida. Printed on reverse side: Orlando is the seventh city of Florida and the largest inland city in the state. It is the county seat of Orange County and located in the very heart of Florida's brick highway system, the heart of the citrus belt, and the heart of the lake region of Central Florida. Original color postcard: "Orange Court Apartment Hotel, Orlando, Florida." E. C. Kropp Company, Milwaukee, Wisconsin: Special Collections & University Archives, University of Central Florida, Orlando, Florida. 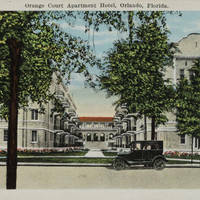 Digital reproduction of original color postcard: "Orange Court Apartment Hotel, Orlando, Florida." E. C. Kropp Company, Milwaukee, Wisconsin. Tag number DP0010655, Central Florida Memory. Original color postcard: "Orange Court Apartment Hotel, Orlando, Florida." E. C. Kropp Company, Milwaukee, Wisconsin. Special Collections & University Archives, University of Central Florida, Orlando, Florida. Originally published by the E. C. Kropp Company. Copyright to this resource is held by University of Central Florida's Special Collections & University Archives and is provided here by RICHES of Central Florida for educational purposes only. Orange Court Apartment Hotel, Orlando, Florida. 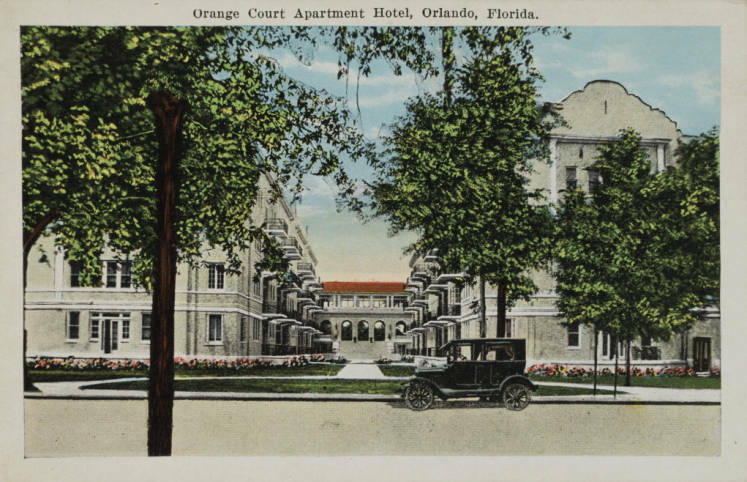 “Orange Court Apartment Hotel Postcard.” RICHES of Central Florida accessed April 26, 2019, https://richesmi.cah.ucf.edu/omeka/items/show/5065.